I told you yesterday how I have become hopelessly addicted to looking at Knock offs in Blog Land lately (deep sigh) well that hasn’t changed. 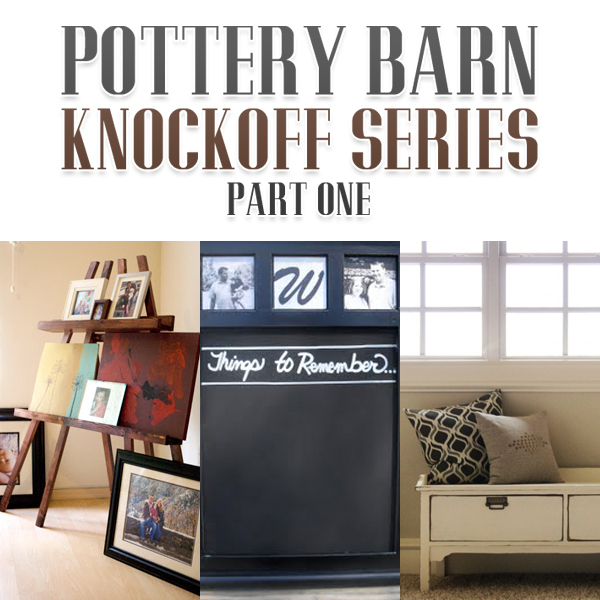 I promised a post on Pottery Barn Knock Offs…so I am delivering one to you today…it’s filled with interesting and amazing knock offs that I think you will enjoy. 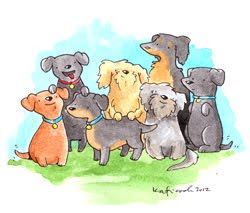 You might want to try your hand at following the great tutorials…they are all spot on and then with your special touch…they will be even more fabulous! Sit back…take a 5 minute break and enjoy. 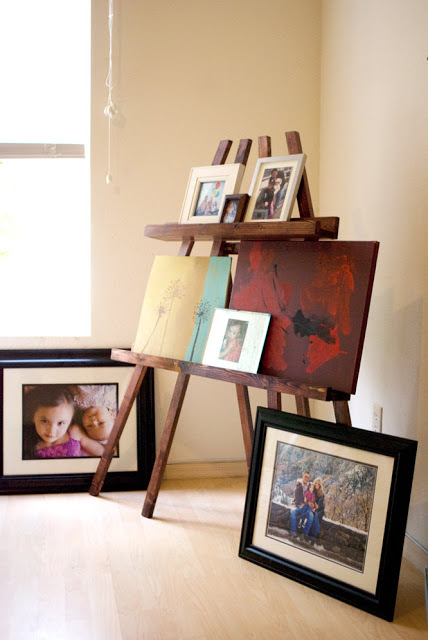 Here is a Pottery Barn Inspired creation from Lady Goats…a gorgeous display easel that is more magnificent and gorgeous than the Pottery Barn original. When I look at this incredible piece…I feel a little breeze of Van Gogh and Monet cross the room. Truth be told…I am totally crushing on this piece! 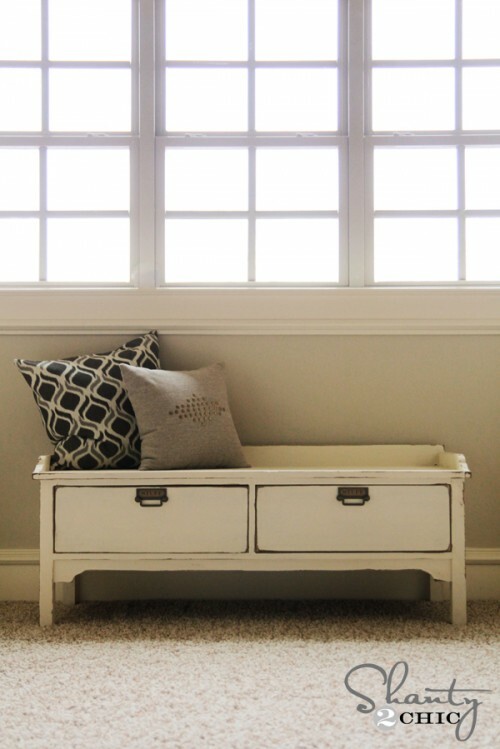 Ok…this might not be an actual Pottery Barn Knock Off…but if Pottery Barn was to start making Dog Beds…I do believe that it would look just like this incredible handmade dog bed from Shanty 2 Chic. 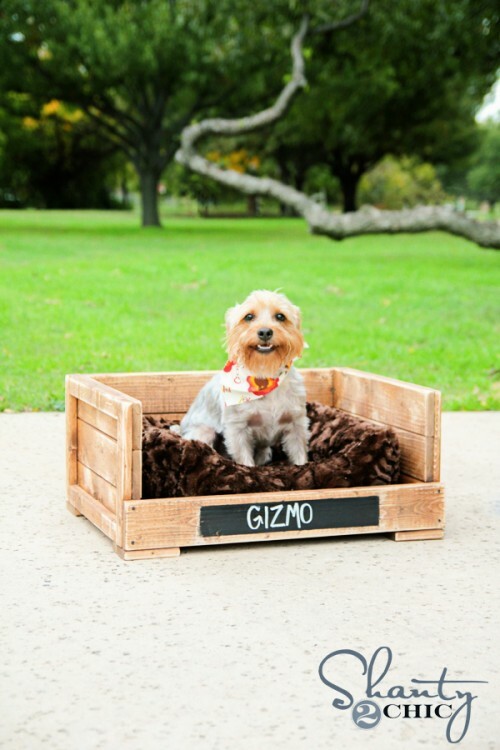 How adorable is Gizmo? If you would love to make one of these for your furry friends…there is a complete diy tutorial waiting for you! You didn’t think I wasn’t going to share a real Shanty 2 Chic DIY Project did you? As many of you know…Shanty 2 Chic has so many sensational Pottery Barn Inspired projects…each one could have a Pottery Barn tag on it and no one would ever know that it wasn’t an original! 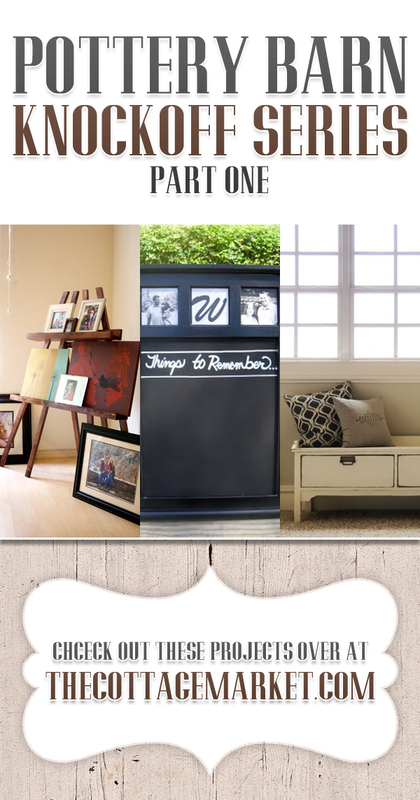 So take a peek at this wonderful storage bench…it’s awesome! 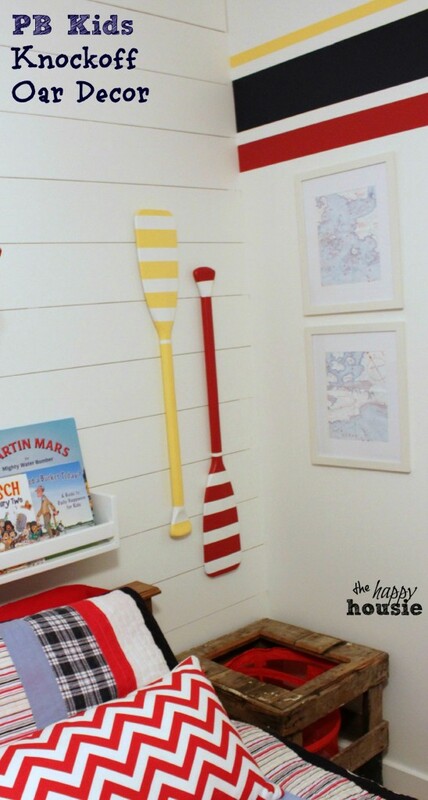 How about a FUN Pottery Barn for Kids project by the Happy Housie…aren’t these handpainted oars fantastic…you would not know the difference from the actual Pottery Barn for Kids version…doing them yourself is less than 1/2 price…they are so easy with the great diy waiting for you. They sure do brighten up the room! Time to check out this awesome chalkboard inspired by Pottery Barn by Just a Little Creativity…how Pottery Barn Perfect does this look! Here is something perfect for you or especially the young lady in the home. 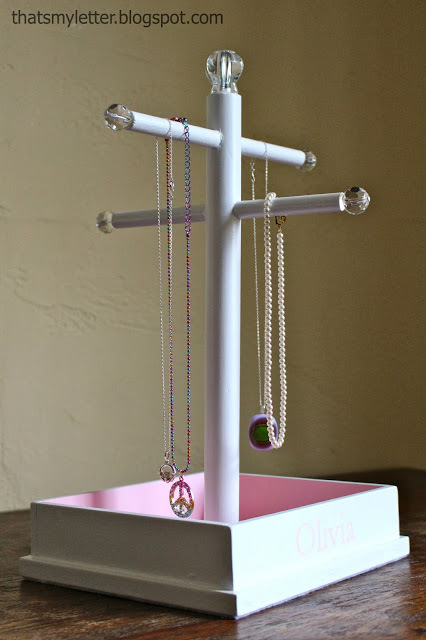 A DIY Jewelry Stand Inspired by The Pottery Barn and WOW does it look like it just walked out Pottery Barns front door! Love it and it comes with a great diy! Drop by that’s my letter and get the details! 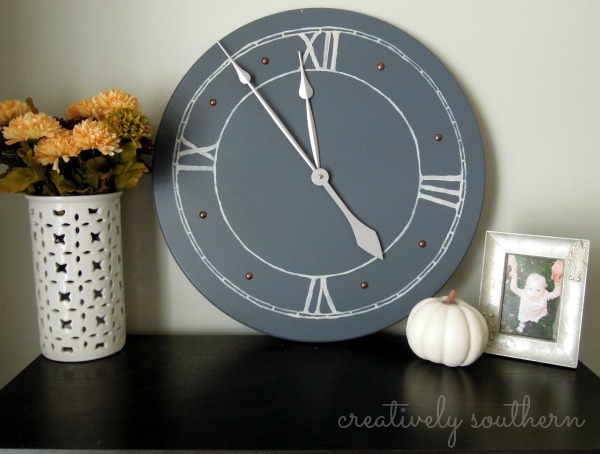 Over at CS creatively southern…you are going to find a sensational Pottery Barn Inspired Clock DIY…except for the soft gray color…it is a twin of the original from Pottery Barn…Need to make this one…goes with any decor. 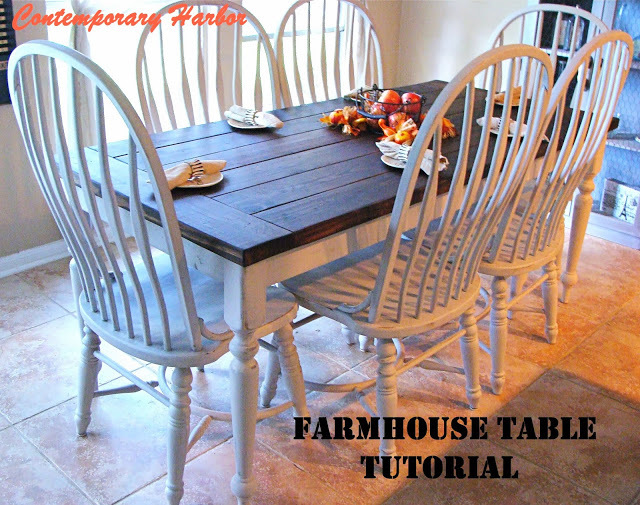 Oh Jennifer at Contemporary Harbor has a gorgeous Pottery Barn Inspired Farmhouse Table DIY Tutorial for us. It’s fabulous! What an amazing job! Here’s another one for the kids and if it was ANY CUTER I don’t think I could stand it! 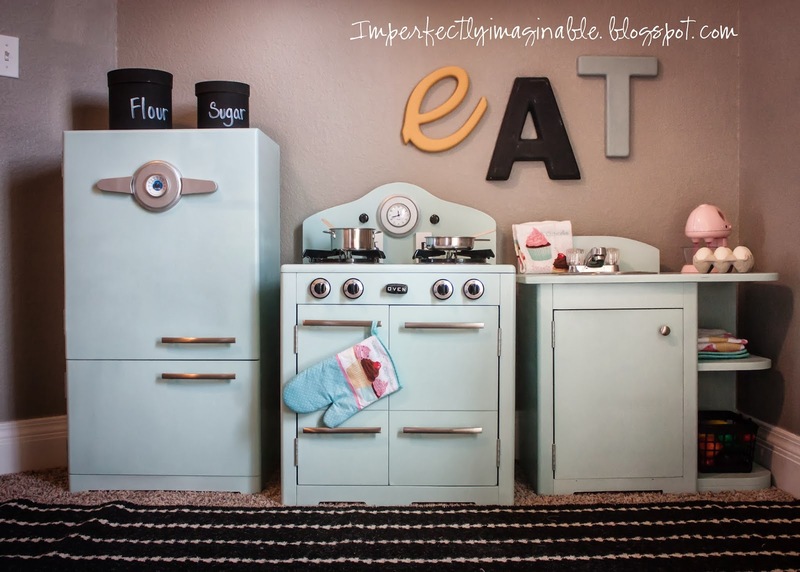 Check out the Pottery Barn Inspired Retro Kids Kitchen from Imperfectly Imaginable…guess what …it includes the plans…the cost breakdown and supply list. Hmmmmm…do you have one of thees in your future…the little ones will go crazy over this! 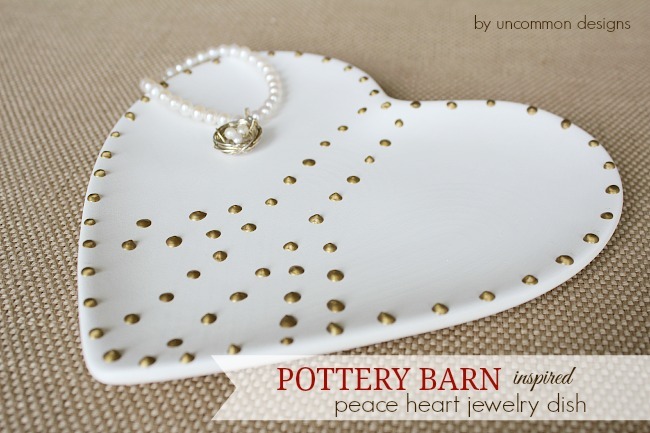 How precious is this little little Pottery Barn Inspired Peace Heart Jewelry Dish from Uncommon Designs…truth be told…I like it better than Pottery Barns original piece. What a great job and yes…it comes with a diy so you can make one for yourself…friends and family! How about 1 more for today…it’s a beauty! 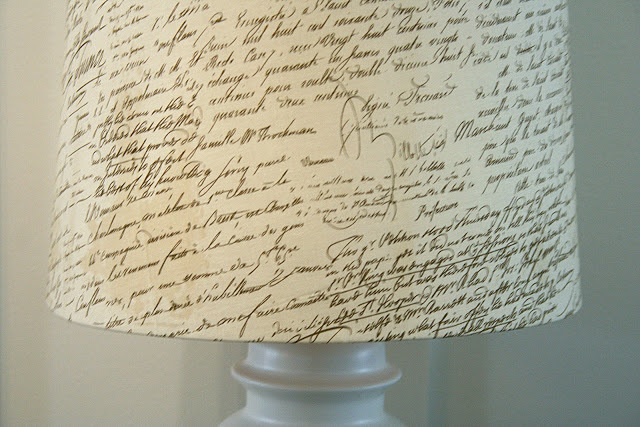 See how Home Stories A to Z take a flea market orange lamp shade and creates a Pottery Barnesque French Script Lampshade to perfection! Well there you have it for today! Not to worry…All of your knock off favorites will be popping up when you least expect it…let’s see if our incredible blog friend artists can keep this series going for a very long time! Do you hear the applause and appause in the background…it is for all the creators!!!! Thanks for all of the inspiration! They all did a great job! 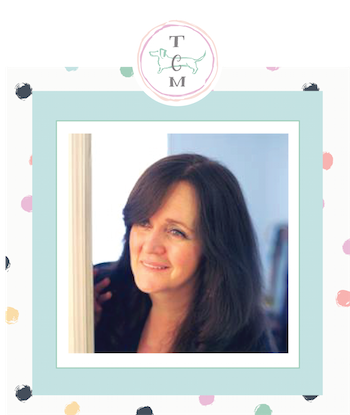 Thanks so much for featuring my farmhouse table! 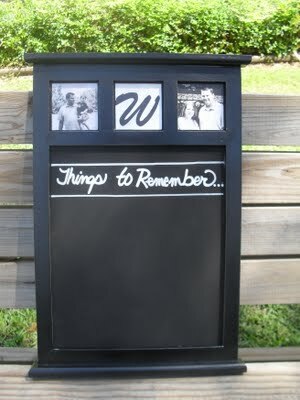 I also love looking at the other DIY projects you listed!! You are so welcome Jennifer! It is FABULOUS!!!!! : ) You take care now and thanks for dropping by! Hugs! Thanks so much for featuring my clock!! So much great ideas and projects here. Love the talent! !